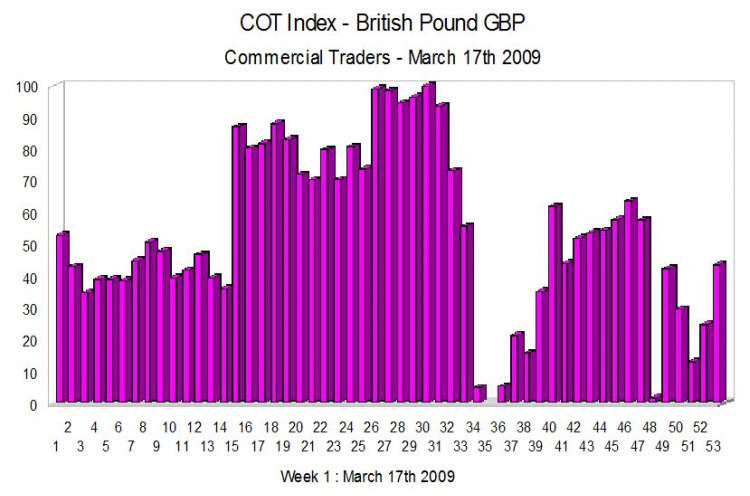 The COT index for the British Pound shows the important turn back in week 32 when the pound stopped rising against the US dollar and started to reverse. The most recent data would seem to suggest that the British Pound has not stopped falling despite it taking a breather in the last few weeks and we may need to wait a while longer before the index can provide us with more meaningful signals when compared with the fx spot market. We should also be aware that the index can also be distorted by the physical number of contracts being traded which are significantly lower since last year – the details of which I will be adding later. It may also be useful to look at this data on a shorter time frame – say 13 weeks and will produce a chart at a later date. All the latest fundamental news can now be found on the economic calendar.